Happy Valentine’s Day! Ever eaten raw beef? Of course, Valentine’s Day and raw beef have nothing to do with each other, do they? In the above picture, you can see sushi. 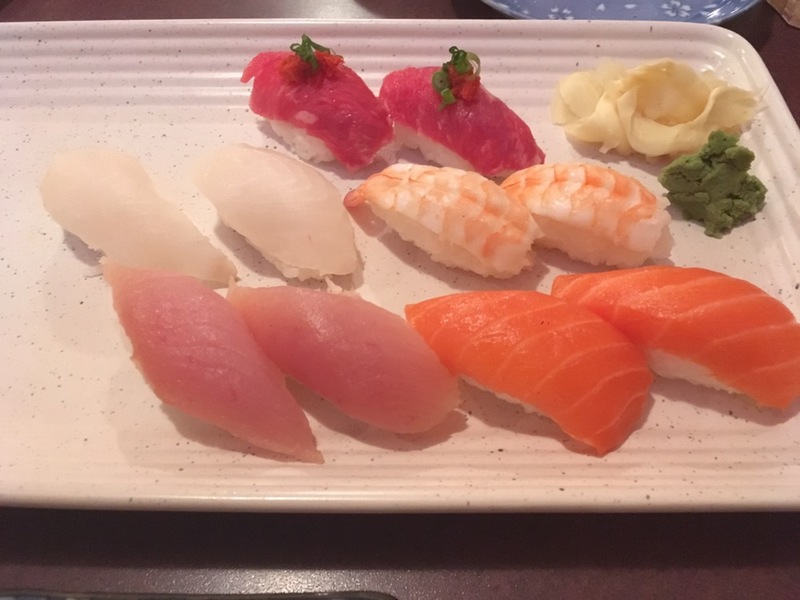 The bottom row is tuna and salmon. The middle row is red snapper and shrimp. But the top row is beef. That’s right, beef sushi. The salmon tasted excellent. The tuna was very good. Shrimp and red snapper were also very good. But how was the beef? Well, it had very little flavour. I’ve tried raw beef before, and I remember that it was rather flavourless. It gains its flavour when it’s cooked. I probably won’t have beef sushi again. Unlike pork and chicken, it’s safe to eat raw beef. It’s unlikely to carry salmonella. And this is why it’s popular to eat rare beef. Have you ever tried raw beef? It was a day of cleaning. Lots of bags ready to go out to the garbage. That was all done in the morning. But the afternoon, four hours to be exact, I spent time going through my daughter’s puzzles and putting them together. What in the world was I doing playing with her puzzles? Well, she’s lost a lot of pieces, and I was checking to see what’s missing. Well, there are still some missing pieces, so I’ll be looking for them as we clean the living room and sort her toys. Maybe I’ll find them all. I hope so. She loves puzzles. 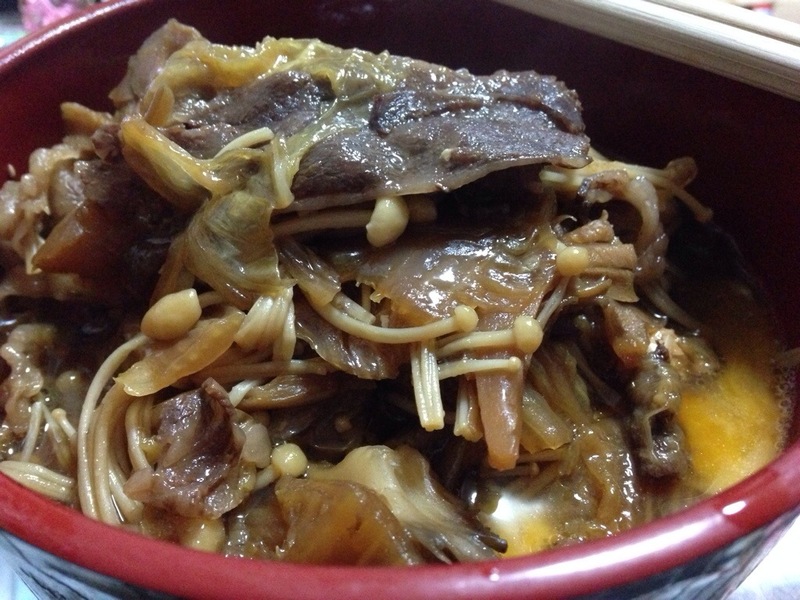 Anyway, dinner tonight is sukiyaki with wagyuu, which is Japanese beef. You know, the expensive stuff. But don’t worry, I didn’t buy it. It was a gift. It tastes amazing! And yes, that orange stuff on the bottom right of the picture is raw egg. That’s something I got used to eating in Japan. Makes sukiyaki taste great! I subscribe to a YouTube channel called Texan in Tokyo, and they made a video called 3 Popular “Japanese Things” that don’t exist in Japan! Watch it first, and then I’ll add some of my comments about these three things. Finished? Okay, let’s look at these things. First of all is the sweet green tea. I’ve heard that’s become common in North America, but since I’ve been in Japan for nearly eleven years, I really have no idea about it. However, that stuff just does not exist here. I can confirm it. I’ve told people about it, and they thought it was strange. And why would you want it sweetened anyway? Real green tea is great! Second is the hibachi grill restaurants. As it said in the video, they exist in Okinawa, but the rest of Japan doesn’t have them. There’s something called teppanyaki, but it’s not the same. You don’t see the performance done by chefs at your table like in hibachi grill restaurants in North America. Actually, one of my favourite restaurants is Japanese Village, which is a teppan grill restaurant, as they call it, but it is not. My wife found the whole experience strange when she went there. None of the food was Japanese. And there’s no such thing as shabu shabu soup. Shabu shabu is a kind of Japanese cuisine, but it’s not a soup. And the third one was the North American version of sushi. I agree, roll sushi (maki) is more popular in North America, but is not so common in Japan. You can find it in supermarkets and sushi restaurants, but they are not the most popular. Nigiri sushi (fish on top of a rice ball) is real sushi. Thankfully, Tokyo Express in Edmonton serves plenty of nigiri sushi. A lot of this is what makes me want to search out authentic Japanese food in Edmonton. Places that are authentic will likely see business from me more often. What are some stereotypes you have about Japan? Let me know in the comments, and I’ll let you know what the reality is. This is nothing new. 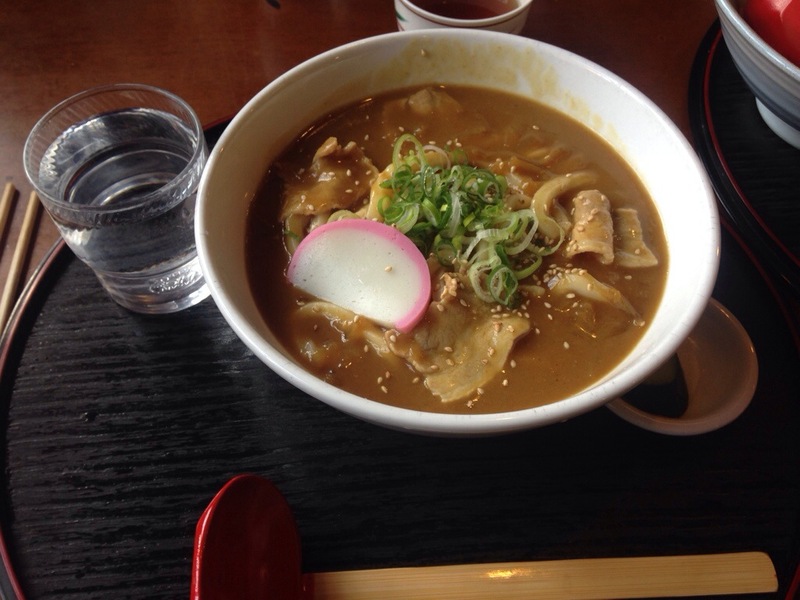 I mentioned this sometime last year that I’d like to do a blog about Japanese restaurants in Edmonton. More specifically, I wanted to review restaurants and rate them taste and the atmosphere of the restaurant, but also focus on the authenticity. Well, I want to expand that idea, since there isn’t a really huge number of Japanese restaurants in Edmonton. I decided I’d focus on the two kinds of food I love: Asian food and hamburgers. Odd mixture, isn’t it? Well, for the Asian foods, I’d like to try out Japanese, Chinese, Vietnamese, Thai, Korean, and Indian restaurants. And at the same time, try out various hamburger restaurants. While I do this, there will be a feature about authentic Japanese cuisine in the city. What am I doing making yet another blog? Well, most of my other blogs are either on hiatus or retired. And this food blog won’t be updated as frequently as the blog you’re reading this on. I’ll update whenever I go to a restaurant, and that’s about it. Comments are very welcome. What do you think of the idea? Let me know! 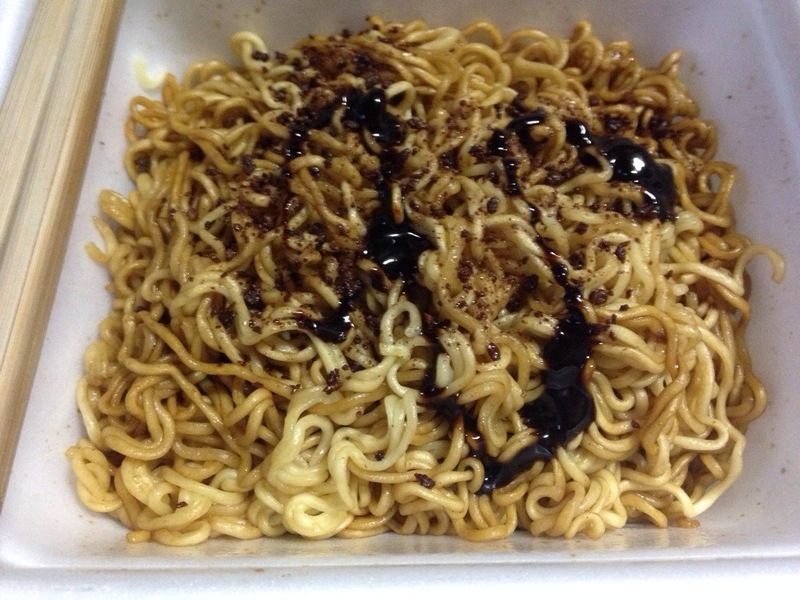 A couple weeks ago, I was informed of a new flavour of yakisoba, which is a kind of Japanese fried noodle. The usual flavours are Sauce (which is a soy sauce based sauce) and Salt (a lightly flavoured sauce based on salt). 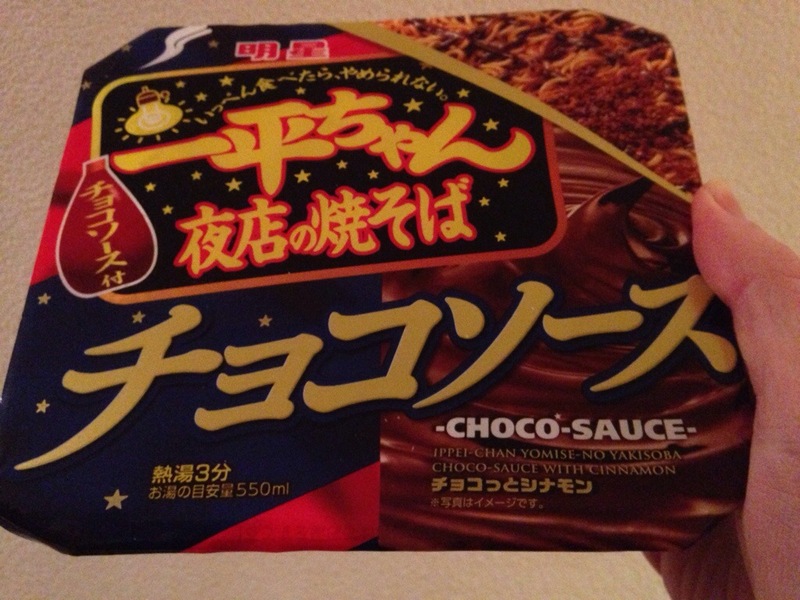 Well, just in time for Valentine’s Day, they’ve introduced Choco Sauce Yakisoba. It looks pretty normal, though the toppings were chocolaty. But pictures just aren’t enough. I took a video of the experience. It’s pretty short, so it’ll only take 30 seconds of your time. Please watch! Do you want to try it? Are there any unusual flavours of food you’ve tried? Let me know in the comments. I have a desire for something a bit unusual. 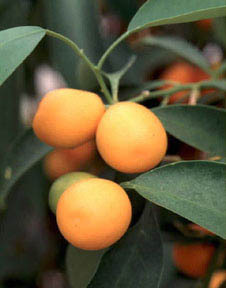 I want to grow kumquats. What exactly are kumquats, you ask? They’re a small citrus fruit native to Asia, and they’re quite different from other citrus fruits. You can eat them whole. You don’t peel them at all. The peel is sweet, while the inside is sour. It tastes pretty good. But I want to grow them. They’re able to grow in colder climates, but they can only tolerate down to -10 degrees Celsius. That means I couldn’t grow them outside in Canada. I’d have to grow them inside. But that’s okay, I’ve attempted growing oranges when I was a kid. I didn’t get any fruit, but the tree lived. I’m curious to see if I can get any fruit. If so, we can eat them. Do you have any unusual goals? Let me know in the comments.